Every summer when I was a Boy Scout, my troop went to S-F Ranch Boy Scout Camp in southern Missouri. One summer, when I was an older scout, we decided to do the high adventure experience held on the unsettled half of the camp. No tents. No running water or electricity. No campsites. Every night we had to set up camp, build a shelter, purify water, and rehydrate the food packets we carried. We learned a little bit about survival skills, though most of us would probably have freaked out if we really had needed to use them. One thing I remember from my time in the “wild,” is how long people generally survive without food, water, and shelter. People can go three weeks without food. It isn’t pleasant, but survivable. Water is less; we can only survive about three days without water (though some have survived longer). The strange one is shelter; if the weather is bad then we need shelter fast, as soon as three hours. In the gospel this week, Jesus says, “I am the vine, you are the branches.” He explains that branches only bear fruit when they remain connected to the vine. Why? The vine feeds the branches. The vine pulls water and nutrients from the ground and brings them to the branches. Without the vine, the branches not only don’t bear fruit, but they die and become waste that is burned. Without Jesus Christ, we will spiritually die. Without remaining connected to Jesus, we won’t survive very long. But Jesus doesn’t just supply us with spiritual water or food or shelter. Jesus offers us the Holy Spirit, the breath of God. This spirit is like oxygen. While we would die within hours or days or weeks without shelter, water, and food, we die within minutes if we don’t have oxygen. The Holy Spirit is that breath of spiritual life that without, we die almost instantly. Do you feel spiritual dead right now? I have to admit I feel like that more often than I should. It isn’t because God has abandoned us. It’s because we aren’t taking spiritual breaths, eating and drinking spiritual food. It is because we aren’t connected to the vine. To be connected we breath in the Holy Spirit, consume true food in the Eucharist, and drink deeply of the water that fully satisfies by reading scripture. May we be branches that bear much fruit! Take a deep breath. Then take 2nd deep breath, but this time pray this three-word prayer, “Come Holy Spirit.” Do this as many times as it takes. Remember your first car? 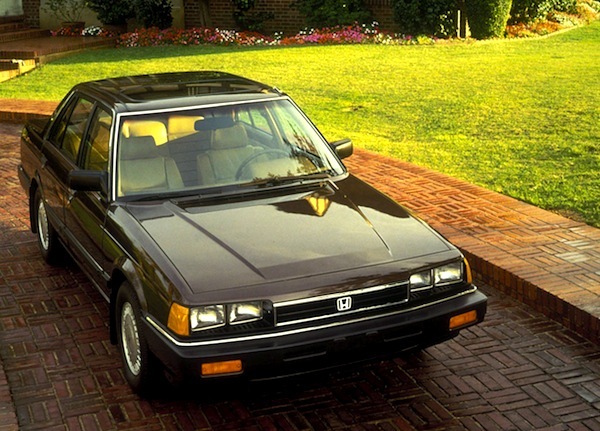 When I turned 16 my parents handed down to me a 1982, 5 speed, 4 cylinder, brown Honda Accord. It wasn’t exactly a beater, but it wasn’t exactly a hotrod either. As much as it wasn’t the coolest or nicest car in the student parking lot, I loved that car. My friends and I named it “The Beast,” mostly because it wasn’t a beast at all. This car was great because it got me from point A to point B every time. Until, of course, it didn’t and stranded me an hour from home with my high school crush in the front seat. That car was good to me until the very end. I wouldn’t let anyone else drive it or wash it or even put gas in it (they could pay for gas, of course) because this car was mine and I wanted to take the absolute best care of it. In our Gospel this weekend we hear about a good shepherd who cares for his flock. But we also hear about a “hired man,” who runs at the first sign of danger. The good shepherd cares for his sheep because he is close to them and they are his. The sheep literally belong to him. The hired man is only in it for the money and when his life is in danger it isn’t worth it. Jesus is the good shepherd; he says so. He explains that he is willing to lay down his life for his sheep, because they are his flock. They know him well. They recognize his voice. They are close to him and he is close to them. I loved my car, not because of anything special it did, but because it was mine. My car didn’t earn my affection. The same for the sheep – they don’t do anything to earn the shepherd’s love and care. No, the shepherd loves them because they are his. The shepherd loves them because of “who” the shepherd is not “how” the sheep are. We can’t earn God’s love for us. None of us deserve the sacrifice of Jesus on the cross. And every single one of us belong to Jesus the Good Shepherd. In the second reading, Paul reminds us that we are God’s beloved children. God delights in us and cares for us because we belong to him. When we were baptized we were baptized to become sons and daughters of God. God loves us because we are his children. God loves us because he is good. What do you care about? Make whatever you take great care in doing into a prayer. If you are extra careful at doing the dishes, make each dish washed a prayer. If you are an excellent cook, say a prayer for each ingredient or step of a recipe. If you are super intense tooth brusher, say a few Hail Marys while you brush. While you do this, remember that God took infinitely more care in creating and loving you. For the complete Sunday readings, click here. Can you imagine what it must have been like to see the first airplane fly? We’ve become so accustomed to the idea of powered human flight that we don’t bat an eye about hopping on a metal tube and hopping off 1300 miles away. Most of us probably worry more about going through security at the airport than whether this 735,000 lbs beast of a machine is actually going to lift off. 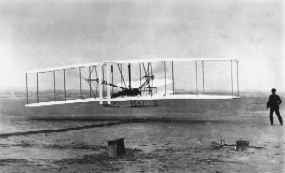 Can you imagine being one of the witnesses at Kitty Hawk, NC while the Wright brothers flew for the first time? I bet someone said, “If I hadn’t been there and seen it with my own eyes, I wouldn’t have believed it was real.” The Wright brothers short flight opened up a new way to travel for everyone, forever. Only 66 short years later, a human being walked on the moon. The first powered flight was 120 feet; less than a century later we traveled 238,900 miles to the moon. Amazing. In our gospel, we hear about the disciples witnessing the resurrection of Jesus Christ. At first they are so overwhelmed they don’t believe it. Their friend and leader whom they watched die and be buried, suddenly stood before them. They had seen Jesus raise others from the dead during his ministry, but this was different and they knew it. It was so inconceivable that a dead man was alive, they couldn’t believe it until Jesus invited them to touch him and then he ate. He wasn’t some ghost, but was alive again. Jesus was the first to rise from the dead, to live in his resurrected body. By Jesus’ death and resurrection, he completed changed human existence. When Jesus rises, he forever transforms what it means to die. Jesus conquers death for everyone, forever. And the disciples are there to witness it firsthand. The question for you and me is – Do you believe it? Do you believe this really happened? Do you believe Jesus rose from the dead and conquered death forever? I can tell you the disciples certainly believed it; they knew it was real. Most of them spent their whole lives telling others about it and were killed because of what they taught. So, do you believe it is real? And if you do, what does it mean for you life? If Jesus really did change everything, what changes in us? Mark 9:24 has a simple prayer prayed by a dad who desperately needed to believe that Jesus could change everything forever. Say this prayer this weekend; look for how Jesus is real in your life. 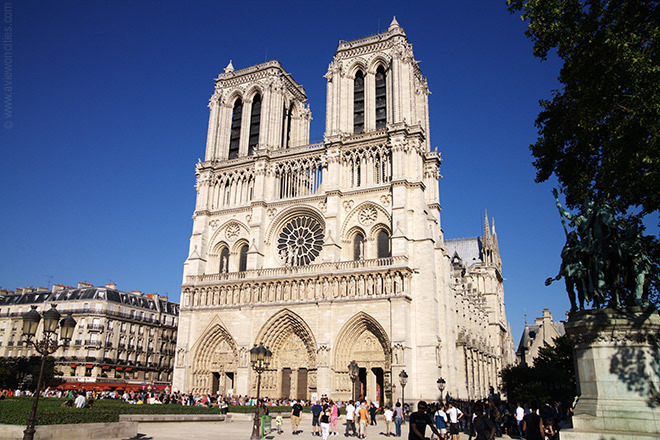 When I was 21 years old, I went to Christmas Midnight Mass in Notre Dame Cathedral in Parish. Needless to say it was pretty amazing – beautiful liturgy in one of the grand churches in our faith. But I almost didn’t make it inside the building. While we were waiting in line, the police announced in multiple languages that the church was full and there would be no more room. Many people left. But my friends and I stuck around and sure enough in about 15 minutes they opened up the doors and we were allowed in. “Good things come to those who wait,” is a classic piece of sage wisdom. We see this in our gospel this Sunday. Jesus appears to the disciples, but Thomas is absent. When Thomas returns he doubts his friends in a grand speech. The next line starts like this, “Now a week later his disciples were again inside and Thomas was with them.” If your friends started saying that they spoke to your executed and buried leader, would you stick around for a week? Would you remain with them? Even though Thomas doubts what his fellow disciples were saying, he still sticks around. Even though he doubted their witness and questioned the resurrection, Thomas stays with the group until Jesus returns. What do we learn from Thomas and his story? If we are doubting or questioning our faith, if it is hard for us to believe the witness of our friends or understand the confident faith of others at church, our best response is to stick around. Even when we aren’t “getting anything out of church,” or finding it hard to believe, if we are willing to wait, God will make himself known and meet us in our unbelief. Then, after meeting the risen Lord face to face, we too can say that Jesus is our Lord and God. Give God 2 more minutes. Either at the end of your prayer time or after Mass this weekend, sit back down and close your eyes and pray for just 2 more minutes asking God to be with you the following week. Invite your family to do this as well; you might be surprised by Jesus.